Our first adventure to the Northern Territory has ended, and now back in cooler climates and our everyday lives, we can reminisce on our trip, and start planning on how soon we can get back there. Before we left, we read up a lot about where we hoped to visit and what to expect. That helped us greatly (check out the links at the bottom of this page for a couple of websites we used and would recommend). And now, we thought we would put together some tips that we learned from in the hope they might help anyone new to travelling in the area of Central Australia. This is totally based on our experiences and might not reflect your own, but it's what we as a family discovered on our first NT trip. They won’t win any fashionista awards, but they save your sanity. Do not leave home without them. People who didn’t have them swathed their heads and faces in whatever they had handy – t/shirts, jumpers, teatowels – to avoid 1000s of flies all around your head. It wasn't even summer!! You may feel a bit silly the first time you wear one, but you soon get over that! I also noted envious looks by those at Uluru who didn't have them, and spent half the time swatting flies all over their faces. This is our number 1 tip for any traveller!!!!! Note: take them off for photos, otherwise you get photos like this one above, just a photo with a black haze where the face should be! These nets saved me losing my mind. They do sell them everywhere, but if you buy them in a non-tourist area, you might save some money. There is a long way between petrol stations and attractions. Don’t underestimate how long it may take to travel, so plan your trip and carry water with you every time. Avoid travel at night just because its safer for you and the animals. The roads are really good between all major attractions, but everywhere takes a fair time to get to, so plan your trip and take regular breaks to stop fatigue. Whilst we went at the end of winter, the temperatures went up to mid-30 degrees Celcius every day we were there. By 11am, it was so hot. The best way to see the sights without expiring, was to get up very early and see everything and do what you wanted, before the heat made it too tiring and unpleasant. Head back to a pool by mid afternoon. We had heard how expensive food was in the Outback. And roadhouses are very pricey (600ml bottle of Coke, was $5.80 at Kulgera). If you are watching your money, don’t shop there! But Alice Springs supermarkets are just like everywhere else price-wise, and the supermarket at Yulara (Uluru) was very reasonable. I had heard complaints about it, but really, it wasn't as shocking as I expected. Yulara is in the middle of nowhere, so you do need to take that into account, but I still got my fave biscuits at the supermarket at Yulara, cheaper than Woolies in Adelaide. Just saying...... If you are concerned, stock up before going anywhere remote, and you will be fine. Alice Springs will have everything you need food and drink wise. I think we all know that is going to be the big expense of a road trip. It’s a fact you need to budget for before you leave. We just recommend that at every opportunity you fill up the tank, because the closer you get to Uluru, the more expensive petrol becomes. Go with a full tank before Uluru, to minimise your need to do a complete refill at the petrol station there (was $2.17pL when we visited). Yes, it was expensive compared to other places at that time of visiting, but we are in the Outback. You just be prepared for it, accept it and think of it as a small price to seeing this amazing landscape. That sunset viewing platform fills up very quickly (and we were there when the peak season was ending). People were jostling for a good spot for their tripods! Get there before sunset to ensure you and your camera find a good viewing point. But, its a must see at least once in your stay. We didn't make it to sunrise, as sunrise is so early!!!! Funny about that. Other times, Yulara Resort has some viewing lookouts that give another sunset vantage point, and whilst further away, gives a great perspective on the Rock but without the crowds. The picture above is taken from the Resort. It was our first night there, and we didn't make it to the actual sunset platform, so this was a nice alternative until we could actually get closer. It still has the "wow" factor. Travelling outside May, June, July, early-August (all peak times) means its not as crowded (though the weather was warming up in late September). But you get to see many places which are not busy, campgrounds aren’t full and you have some places all to yourself! We loved seeing some Gorges where we were the only people! We walked around some famous Gorges, and hardly a person was there. It really allows you to appreciate the beauty when you are there by yourselves (or nearly). Campsites are not as crowded, which means you will have greater choice where you set up. What you need and want in a campsite comes down to personal preference. We have written up reviews of a number of Northern Territory camping sites and they were only a small proportion of the many places you can camp in this part of the NT. Of course, as all reviews reflect our personal experience at that time, you might differ in your opinion if you have travelled there. One factor that we found with nearly all of them is that shade is minimal. BYO shade shelters because you will most likely need it, especially in warm weather. This is a big factor at our Kings Canyon campsite. Despite it not being summer, shade was imperative, and highly sought after in this location. 3G coverage was very touch-and-go. Even a short distance outside of Alice Springs, we had no coverage with our mobiles. Do not rely on your mobile as a means of communication. A satellite phone or UHF radio might be something worth thinking about (can be rented) if you are planning on being remote for any length of time. We didn’t have a satellite phone, but should we drive up that way again, I think we would rent one. For every walk you do – be prepared. Sunscreen, hats, comfortable walking shoes, and most importantly – plenty of water. And start early on your walks, to avoid the heat of the day. We started early for Uluru, but that's a big walk, and by the end of the trek, we were all fading in the heat. If I had to do it again (and it's so great, I would), I would start even earlier. A walk at Kata Tjuta gets closed after a certain temperature is reached. I was a bit sceptical about visiting this park in case it was a bit touristy and not really representative of what we had seen already. So not sure if this is really, a tip - but I am going to put it in anyway! The tip is: go to this tourist attraction! It would have to be one of the best parks in Australia. So interesting, with so much to see. Allow yourselves plenty of time to see and do everything on offer. I think we were there about 3 hours, and only due to heat, we cut it short. Friends travelled there and they didn't love it as much as we did, but they spent even less time there than us, so I think they really missed out on taking in everything it has to offer. We had photos taken with a wedged-tail eagle for an extra cost. That was an experience to be up close and personal with this magnificent bird. You can't pat it, but it certainly is impressive. You need to book that experience (and others) at the time of entry. You will learn so much there, and it is magnificently set out, making it a real pleasure to see. 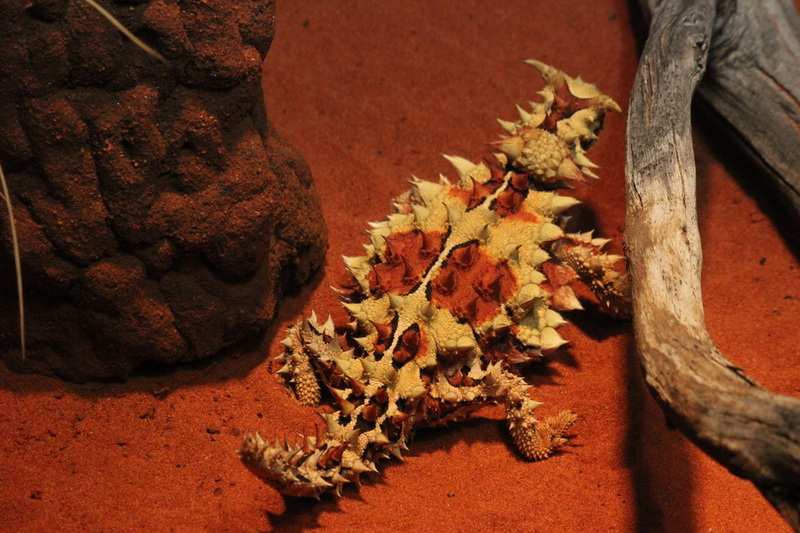 Only place I saw Thorny Devil was at the Desert Park! If you can, take your time wherever you go. I don't mean driving time (but do that too). But time at all the sights. Don't rush to see every single thing, but enjoy every sight properly. 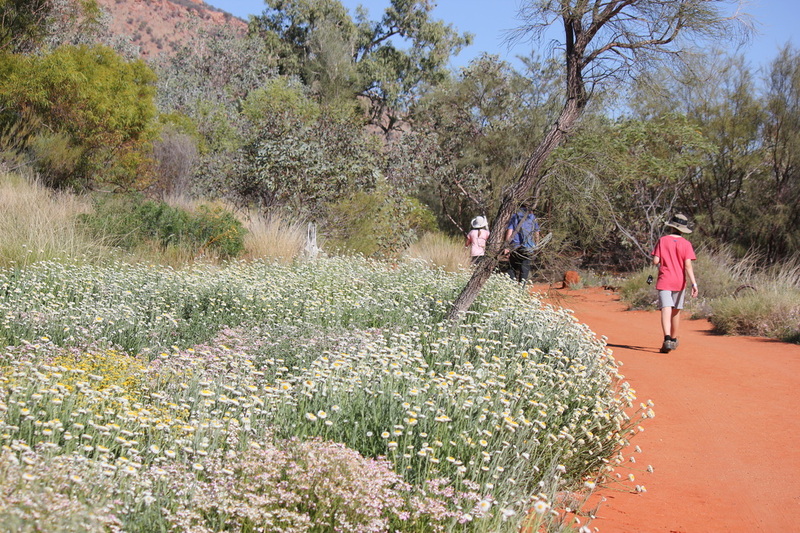 For example: To really appreciate Uluru, walking around it is the way to go. It does take a fair amount of time, but you see so much more this way. I think people who just drive near it and stay in one viewpoint really don't get to the see the majesty of this icon of Australia. Just heed our advice on starting early in warm weather. Rushing to see every single attraction can easily happen on a short time frame, but just being able to sit back and observe the beauty is such a great way to experience this part of Australia. Stop frequently for photos when on the road. Capture the moments - you don't know when you will be back this way, so take your time to appreciate the beauty that abounds. To see all the major sights around Central Australia, you will note that most of the roads are sealed and in good condition. Some tourist attractions have parts of the road which is not sealed, but 2WD can make it easily – as they are popular areas, the roads will be well maintained. But do know your route and what sort of car is allowed on the road. If a road says its 4WD only – pay attention to that important fact, and obey the rules. Help may be a long way away if you get stuck. We hadn’t read that 198km between Kings Canyon and Alice Springs was going to be dirt road, and very corrugated in parts (every part of our car and bodies were rattling away on this road). We were in a 4WD but the road meant that we had to go a lot slower than our trip plan had indicated, and we ended up travelling into early evening which we try to avoid. I literally thought we would never get to Alice Springs. And there were hardly any other cars on this road. We began to doubt we were heading the right way!!! The above is just a taste of what we experienced on our short break to the NT. There is still so much to see and do.